You'll be £4.99 closer to your next £10.00 credit when you purchase Tracing Your Prisoner of War Ancestors: The First World War. What's this? The experience of civilian internees and British prisoners of war in German and Turkish hands during the First World War is one of the least well-known – and least researched – aspects of the history of the conflict. The same applies to prisoners of war and internees held in the UK. Yet, as Sarah Paterson shows in this authoritative handbook, a wide-range of detailed and revealing information is available if you know where to look for it. Briefly she outlines the course of the campaigns in which British servicemen were captured, and she describes how they were treated and the conditions they endured. She locates the camps they were taken to and explains how they were run. She also shows how this emotive and neglected subject can be researched – how archives and records can be used to track down individual prisoners and uncover something of the lives they led in captivity. A key comprehensive reference book for researching the lives of the Great War captured combatants and internees of which there were about 10 million and gaining an insight into how they were treated and the conditions they endured. Paterson’s experience shows clearly in the thoroughness of this extensive research guide. This is a must-have for anyone who knows, suspects, or thinks they might have a World War I prisoner of war in their family tree… Because this book resulted from the author’s knowledge of the questions asked by researchers over many years, it displays a deep understanding of where readers are likely to get stuck. It fills a need for a comprehensive, practical guide to tracing World War I prisoners of war and learning about their experience. This is still essential reading for those who want to try to locate a WW1 POW relative and to learn about the places and conditions they were held in. As will be inferred from earlier, this book should also be of help to German family historians tracing POWs in Great Britain. Friends of The National Archives. Of particular interest and value in this book are the appendices, which comprise over a third of the text and which include lists of POW camps and descriptions of how they were run. Through these, the researcher is directed towards the key resources for tracing POWs in British and Commonwealth records. Apart from POWs in Germy, it is possible to try and trace British prisoners held in other areas such as Bulgaria, East Africa and Turkey, using the lists of documents and records available and the useful list of abbreviations used throughout the book. 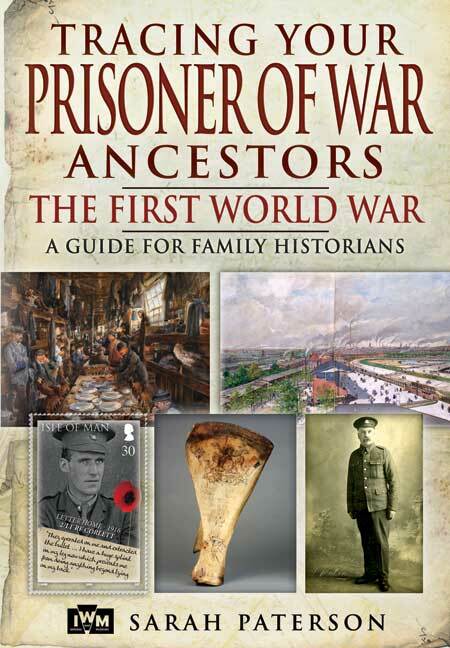 For any family historians seeking to trace an ancestor in the armed forces who was imprisoned in the First World War, this book is an essential tool to discovering a personal wartime story from almost one hundred years ago. The experience of civilian internees and British prisoners of war in German and Turkish hands during the First World War is one of the least well-known – and least research – aspects of the history of the conflict. The same applied to prisoner of war and internees held in the UK. Yet, as Sarah Paterson shows in this authoritative handbook, a wide range of detailed and revealing information is available if you know where to look for it. Briefly she outlines the course of the campaigns in which British servicemen were captured, and she describes how they were treated and the conditions they endured. She located the camps they were taken to and explains how they were run. She also shows how this emotive and neglected subject can be researched – how archives and records can be used to track down individual prisoners and uncover something of the lives the led in captivity. The author works at the Imperial War Museum and recognised that a single guide was needed and this book certainly pulls all available information together. It concentrates on areas of research where information is sparse but also caters for those people who know little about the subject. Apart from providing all the background information on the subject, the book provides details of each POW camp, a comprehensive bibliography and lists of useful websites and organisation addresses to take your research forward. The one is certainly on my Christmas list – highly recommended. This really is one for the family history researcher with an interest in a conflict now vanishing from our sight. This invaluable work should be at the side of anyone interested in finding out more about family members who were prisoners of war. Published in conjunction with the Imperial War Museum, the book is authoritative and provides a wealth of information including lists of the various camps at home and abroad. The book is aimed at those with little knowledge of the subject, but is certainly one that everyone will find useful. An excellent introduction to a subject that has received precious little attention in the context of both the First World War and the experiences of prisoners of war from other conflicts. Sarah Paterson outlines the general conditions of camps, not only under German and Turkish control, but also those in neutral countries and, by contrast, the experience of German prisoners of war and internees in the British Isles. Typical experiences of officers, other ranks and civilians are described, and the extensive appendices list camps, recommended reading, and links to those archives and museums which hold information on prisoners of war. Highly recommended for anyone wishing to research the subject. Published in July 2012 by Pen & Sword Books in association with IWM. An invaluable guide for anyone trying to trace an ancestor who was a POW or internet in the First World War. Sarah Paterson has a long-standing interest in the history of prisoners of war. Through her work in the library at Imperial War Museums London, she has extended her knowledge of the subject by dealing with the growing number of requests for help in researching the lives of individual prisoners. She is familiar with the many archive sources that can be consulted, and has used them in order to compile the case studies in her book.